This is the story of how I locked myself inside my room for 29 hours and only left after finishing one of the craziest tech wargames/treasure hunt I have ever taken part in. For those of you who don’t know, Pixels Camp has a quiz show. To get to the quiz show, you have to be tortured get through a very good and awesome and oh so fun, so amazingly fun qualifiers. The qualifiers run for 4 weeks. Then there’s a week off. Then the 16 top players get to find a partner to violently murder the quizmaster go on stage and make fools of themselves. In order to do that, you get asked questions and then you fail. Invariably. Eventually consistently. 2 editions ago, me and @naps62 failed so hard we won. The next year, we felt a bit more confident and got swept in the first round. As far as logic goes, leave it by the door of the quiz finals and pick it up afterwards. Think you know the answer? You don’t. Been feeling like a champ? You’re gonna get chewed up and then made fun of by the quizmaster and probably your own coworkers who, incidentally, had been not only watching it live but also recording everything for reaction gifs (yes, oddly specific, I know). Every year the qualifiers have a treasure hunt. That is one of my favorite things in the world. First because you get mentally challenged. Second because if you fail, you can just blame it on the lack of time and how popular you are. yeah, I couldn’t do the qualifier because it starts on a Friday night and I’m out at the pub unlike YOU LOSERS AHAHAHAH also does someone have any tips for step 3? Third because it gives you a reason to hate on another human being. And, let’s face it, we all love blaming our beloved quizmaster, @carlosefr, for our own shortcomings. I hate you quiz master, I haven’t slept properly for 7 weeks, I’ve been putting on weight since 2016, don’t feel like going to the gym and it’s all because of YOU. YOU and YOUR STUPID TREASURE HUNT. Enough chit chat, let’s go through the solution. There are no rules, but there are patterns. It’s never too complicated. It’s usually a single solution step. If you have an image, you have all it takes to get to the next level. You won’t need to do the hex dump of the image, convert it to decimal, factor out the primes, convert to ascii and that will give you a riddle to solve. If you have an image, everything you need is in there (sometimes literally in the image). And, again, it’s usually a single step. The multitude of steps like the one I showed you, will give you uncertainty. You won’t know if you are on the right track. But with the treasure hunt you always know and you should keep this in mind. If you find you are uncertain in your solution, it’s probably wrong. Yep, that’s right. Reverse google search. The reverse google search lead nowhere. So what’s next? My cryptographer brain was prepared. Years of study and long nights reading through complex mathematical formulas all built up to this moment. You see, there’s this little trick known as frequency analysis. Basically it consists in taking every symbol of the ciphertext, drawing it carefully in a notebook and ignoring it because the right thing to do is to google “weird alien fonts”. After spending some time in questionable websites which had every possible font, the solution: this is the Aurebesh alphabet! I found this quite amusing. It’s literally the image for “Languages in Star Wars” in Wikipedia. Perfect, we need to use IPFS. All the IPFS hashes start with Qm. But where do we find the hash? Like I said, all we need is in the picture. Important sidenote: the original image had transparency, so it wouldn’t show on this page. I uploaded an altered version which might not include the hash. So if you try it yourself with the uploaded image, beware of different results. Ok, we’re missing quite a byte. At this point I wrote a program to brute force the remaining byte. But nothing worked. What do we add? The treasure hunt is supposed to be a brain challenge. Having you guess random stuff isn’t the MO. What do we have then? A hash with a byte missing. A message saying to use IPFS. What wrongful assumption are we making? Turns out the quizmaster is really cheeky. Our assumption that he is telling us to use IPFS is not wrong but incomplete. He’s literally telling us to use the Qm prefix. So you add Qm to your hash and now you have an extra byte. You remove the final G and you go to the IPFS gateway. It works. A double Qm hash! Oh, how devilish. This forced our quizmaster to make that step harder, which in turn led to the double Qm hash. Oops. My intuition told me to inspect the file carefully. There was no hidden data, no metadata of any kind, no extra whitespaces or invisible characters. Nothing. WYSIWYG. This was one of the hardest steps, personally. What could it be? The title of the challenge was Mojibake?. I started with esoteric languages. When that didn’t work, I tried to think of encodings that could fit. I tried different text encodings. Then, I focused on the # sign. Googled every cipher I could, to see if one converted text to numbers and if any used the # sign as a delimiter. When that failed, my attention shifted to HTML entities and later even hebrew. @naps62 noticed the sum of each line was always 67. I noticed that every line was a different permutation of 67. I tried to search for ciphers around the number 67. I went back to esolang and went through every language on the list. Nothing would fit. I went to bed 7 hours after the challenge started. I couldn’t stop thinking about it. I barely slept. I woke up in the middle of the night with the idea of Run-Length Encoding. I had to code a C encoder & decoder in my first year of university and that moment came to me suddenly. I dismissed it, it wouldn’t make sense. RLE transforms aaabbbbcc into a3b4c2. Looking at the text, we were missing characters between some numbers. The 1 at the didn’t have any character. I woke up again thinking about prime factors. Then again thinking about the LCM of 67. It wouldn’t fit, this was sum, not multiplication. I don’t know how long I slept in total, but I was very much sleep-deprived going into the second day of the challenge. I grabbed my computer and started reading about number based ciphers, once more. @pfac, the remaining member of our triple trouble team for every Pixels Camp quiz, suggested chess moves the night before. Wouldn’t fit. I was getting frustrated. At this point, I hadn’t left my room for 16 hours. There were some whispers between other participants of thinking of it like a grid. Then it hit me. 4 2#4: 4 spaces, 2 #, 4 spaces. The 1s at the end were 1 newline. Well, how nice. A QR Code. And here I was searching for ciphers and text in it. Turns out most QR Code readers don’t really like the # sign, so we can change it for the FULL BLOCK character. My experience from the previous treasure hunts immediately told me what this was. It’s a nice taunt. It’s a hash, but it’s tiny. What do you do with it? tinyurl.com/96f493f1. My first step was again to analyse the image. No metadata. No extra content inside it (unlike the previous one). Nothing. One thing caught our attention. 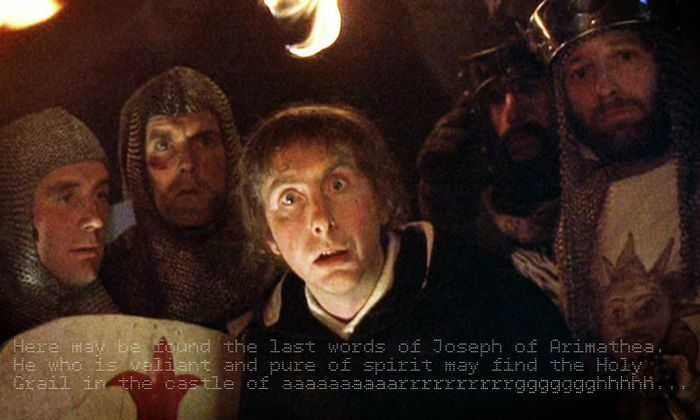 The letters in aaaarrrrggghhhh have different fonts. Some are composed of +, others of -. I split these into two words. It was obviously a sort of binary code. What binary codes do we know of? I tried tap code and morse code. Nothing. Could be morse, could be tap code. An IP maybe? And then he saw it. Yep, it’s a binary code. Literally binary. I wasted away an hour before thinking of the obvious. Was I in a bad mental state? Yes. Was this a sign I needed coffee? Yes, a lot. 32 bits of binary. It’s an IP, he told me. We have cracked the grail. The IP address had a single file in it. synesthesia.png. Synesthesia is basically your brain going belly up and you starting to hear colours or seeing sounds. Your senses get all mixed up. What senses can you tickle with a computer? Vision and hearing. It was obvious to me, the image had a sound file in it. The first qualifier I went through, a few years ago, had content hidden in one of the channels of the image. I isolated all the channels separately. Every permutation. Red, Green, Blue, Alpha, Red & Green, Red & Blue, Green & Blue, RGB (no alpha). Two things caught my eye. The “no alpha” version and the “alpha” version. Let’s start by analysing alpha.png. I had seen this type of pattern before in a different wargame. Sets of squares in grayscale, almost randomly, an indicator of a binary file with the PNG headers around it. They seem like random noise, but they really are not. You can clearly see some lines with similar “gray” values. Usually this indicates that there is information concealed. 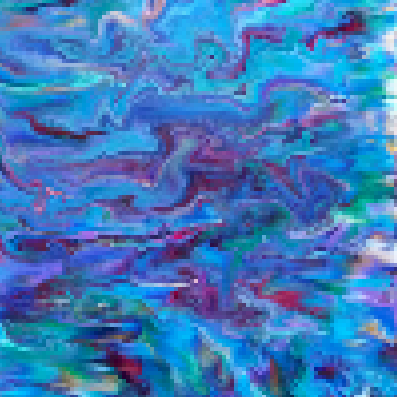 There’s nothing interesting in this image, except that it does look like an actual image instead of the spaghetti mess that synesthesia.png is. I reverse google searched the image and found the original. The evil quizmaster stole this artist’s intellectual property and compressed the image almost beyond recognition, all in the name of producing a mastercrime of a challenge for us. How thoughtful and sweet. Having seen the original, I took it as a confirmation I was on the right track. Before going back to the alpha.png image, we need to understand how PNGs work. Images, in general, are grid of pixels. Each pixel has 3 values ranging from 0 to 255. One for each of red, blue and green. The intensity of each colour combined determines the final colour of the pixel. For each channel we need 8 bits. 24 in total for a single pixel. PNGs in particular can have 32 bits. The final 8 bits are for transparency. AKA the alpha channel. My reasoning was set on the audio file being in there, everything pointed to it. However, when I extracted the alpha channel it was still an image. The problem was that during the extraction, I was converting back to a PNG and stretching out that information again, adding in the headers and in general screwing everything up. 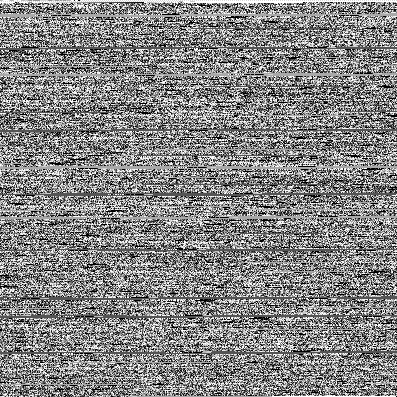 I needed a way to remove the 8 bit sequences and placing them into a single file without converting it into an image. I was almost starting to implement my own code to do so when a dear friend (to whom I owe a beer for preventing me from doing this), hinted me the correct command. He googled for more imagemagick options. I googled for C vim plugins and libs, ready to get my hands dirty. Let’s ponder about that for a second and never speak of it again. TO AVOID CREW SUSPICION REQUEST INFO WITH SMALL BACON. ONE BACON ONLY. To… some… server? I think? Ok, let’s break it down. We have to make a request for info. We have the previous server IP address, so intuition tells us it’s that. At this point I tried some custom headers. Content-Type: Bacon, Authorization: Bacon, Footloose: Kevin Bacon, Accepts: Bacon. Nothing. Not even Francis: Bacon. At this point, the quizmaster, ever so helpful, said something that… threw me and @pfac off as apparently we both thought the same. Hurry… Be quick… QUIC! That’s it! Aaaaaaaaaand we went in circles for the next hour. Elementary, now! We need to ping the server. How did I not immediately think of that? Of course it’s not replying to pings. This is actually a good indicator that we are onto the right track. After googling the ICMP echo request message format, we can see that it has a payload. At this point I was fairly certain we needed to send bacon (lowercase. Remember, “small bacon”) as the payload. How? I was so certain of it. I’m not even sure how this happened, but @pfac said something like “I’m gonna try this on Linux. Can’t trust these Macs” while I just stood in disbelief. Aaaaaand of course it worked, how could it not? To this day, I don’t know why. Running the same command on macOS yielded nothing. After the quiz I asked the quizmaster about this and he went through the server logs. Nothing was coming on the payload of my requests so, yeah. Thanks for that, Apple. And you know what? This was much better! Want to know why!? It gave you the reply payload! Normal ping didn’t! Poor @pfac had to install Wireshark! And JAVA! EWWWWW. This was fairly obvious. Where else would you leak a data breach? I've read this and, frankly, it's really embarrassing. Nah, mate. I just googled “PDU Decoder”. Stick it in here. Apparently that’s a Protocol Data Unit? Anyway, it outputs the final text.